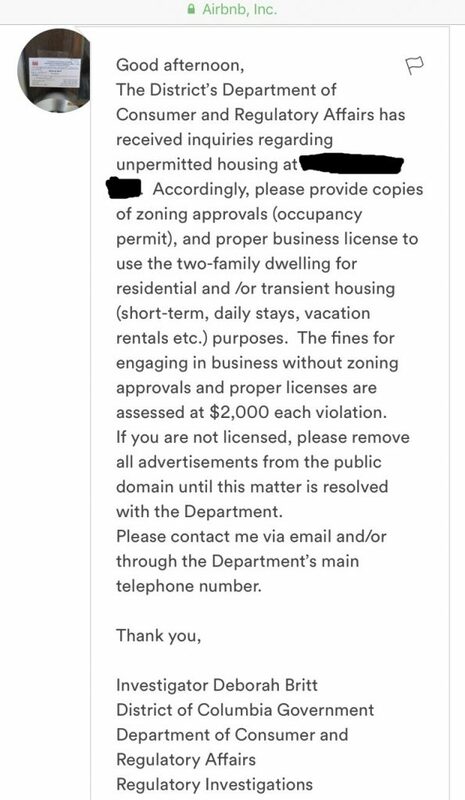 PoPville » DC AirBnB Crackdown? I got this message (above) through AirBnB. I’m not sure if it’s a scam or if DC is actually using false guest profiles, requesting to book for specific dates and then using the messaging capability to threaten to shut down rentals. Have any other AirBnB hosts in DC been contacted like this? Any lawyers or code-savvy readers have advice on dealing with this? We live in a two-unit row house (zoned RF-1). We obtained a certificate of occupancy immediately upon creating our basement apartment and have been happily renting our basement through AirBnB for a little over a year (paying DC upwards of $5,000 in hotel-style occupancy tax over that time, through AirBnB), plus income tax to the city on our earnings.